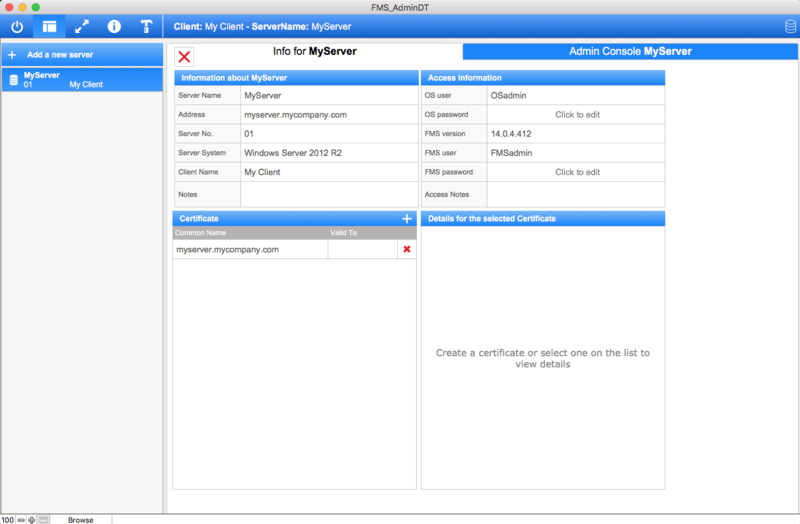 In order to celebrate this properly, we have created a desktop version of the FMS ServerAdmin tool, that we are giving away for free. Download the tool below. UPDATE: If you already downloaded this tool, you will notice that now you can also select to build FM15 installers. Watch the movie to learn about the features. Congratulations, Claus. It is long overdue. This is an amazing and wonderful tool and to provide it free is truly generous. Congratulations on your new Partner status. It is well deserved. Thank you. I really like your FMSAdmin solution. Great that you are making it available to the community for free. As you know, FM developers can finally submit apps to the Apple App Store which is a great development. Having gone through the process it is not all that straight forward so if you can create a solution that interacts with Xcode and handles the certificates not to mention app images and description that could be very helpful and certainly does not need to be free. Thanks, Ralf. Glad you like it. Regarding FileMaker iOS App SDK, you are right that it is not straight forward in the sense that you need to setup the provisioning profiles etc. However, if you have ever done anything with xCode, this is so much easier than building a xCode project from scratch. If you want to learn more about building native iOS apps with the SDK, I would highly recommend attending DevCon in Las Vegas. Richard Carlton and Todd Geist will be hosting sessions on this topic.